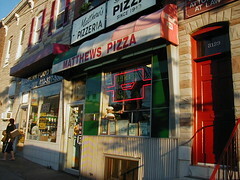 I wasn’t born when Matthew’s Pizza opened their doors back in 1943. Neither were my parents, for that matter. Nevertheless, I was told that Matthew’s Pizza is revered by Baltimore residents and critics alike and that I had to give it a shot. When it comes to local pizza shops, I don’t need to be told twice. The building itself is nondescript brick faced business front with a marque set against the colors of Italy, one block east of Patterson Park on Eastern Avenue. Countless reviews and accolades from the local papers are mounted to the front window. The place is packed, line almost out the door; you can see the people waiting from the street. We had phoned our order in before heading down to pick up the pizza, which I’d recommend. No telling how long the wait would have been for a table. We ordered a large margherita (which for the uninitiated includes fresh basil, freshly diced tomatoes, fresh mozzarella, and extra virgin olive oil). A large is about $9.50 after tax. The crust was crunchy like a cracker, but drizzled with olive oil. Not as light and thin as Ledos crust, but very tasty. The tomatoes were fresh, juicy, and almost sweet to the taste. The cheese was good, not but soaked into the crust, softening it a little. 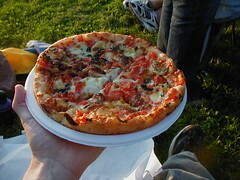 A large pie is only 10″ but once the weight of the oil and crust catch up with your appetite it’s a great meal for two. Add a small salad ($3) and you’d probably be all set for an evening. Their salad with the dressing and red onions is a wonderful way to start the meal! The pizza is amazing. I forgot if this was BYOB or not. I’d love to go back soon! Sounds delicious but there are too many good pizza places in Columbia/Ellicott City for me to make a special trip just for ‘za. TBB: Their web site doesn’t say and I didn’t see anyone walking in with their package goods. yellowjkt: It’s rare that I order pizza when out of a home and even more rare when I order it at a sit down place, the exception being Ledo Pizza. I’ve never really gotten into Ellicot City, but I have been wanting to try out ZPizza. Sounds like you just got a carry out. If so, it is WAY better if eaten there. I live less than one block from it, and I still it eat there because it’s so much better. Once they rap it up in plates the pizza steams, and totally make the pizza gooier! Corey: I would like to return, but I’m not a big fan of waiting in lines (even for crispy pizza crust). Since you’re down the block, what are some of the best off-times to go?